ARE YOUR BOOKS A MESS, BUSINESS OWNERS? Let US Rescue YOUR Books Today! When you hear the word “audit” do you think IRS? A large majority of business owners equate “audit” with a letter from the IRS — and the entire process following. Fortunately, there is more than one kind of audit in business. As your master bookkeeping professional serving Maryland, Furever Bookkeeping strongly suggests that you do an internal business audit. It’s a great way to get an understanding of where your business stands. Call Me, Now! You don’t want to be blindsided by an unexpected issue. As the business owner, you’re the primary decision maker, and you need to know your business and where it stands better than anyone else. This knowledge will save you money and time. Now that you understand what an internal business is audit, you need to know when to complete one. For most, an internal audit is a happenstance occurrence that is prompted randomly due to someone suggesting it. Instead of waiting for a prominent catalyst, we’ve put together a list of prompts to signal that you ought to conduct an internal audit. If you’re seeking investments, the investors will request an audit to determine if your business is a good investment. 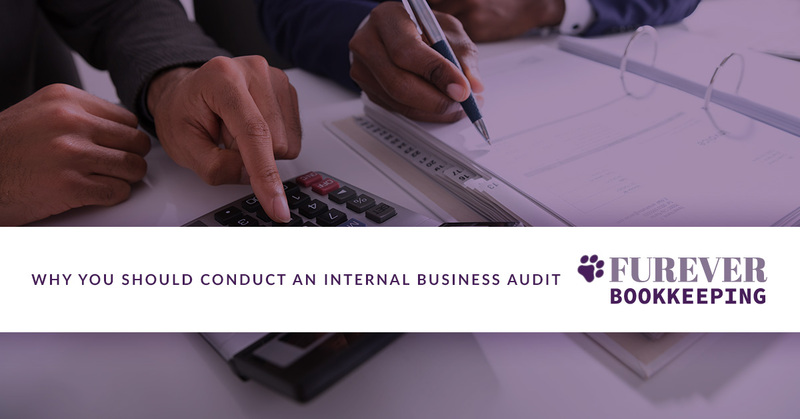 Prior to seeking investments, conduct a comprehensive internal audit of your business and have that available to show you’re serious about growing the business — especially if they’re investing. If you discover at the end of the month that there is a moderate to substantial mistake with your finances, it’s time for an internal audit — and to hire a master bookkeeper for your Maryland business. Sweeping financial mistakes under the rug only compounds the issue when it resurfaces down the road. Your key employee resigns from the business. They had prominent management and decision making privileges. It’s time to conduct an internal business audit. You need to turn over every single stone, including ones related to your own responsibilities to know where your business stands. Declining cash flow is a serious red flag for your business’s health. Cash flow is how you grow your business; without it, your business will eventually cease to exist. A downward cash flow trend demands an internal audit. Finally, you ought to conduct an internal business audit because you’ve scheduled it. Ideally, you will need to determine how often you will conduct the audit, but we strongly suggest you schedule it so that it doesn’t go amiss months down the road. You want to increase cash flow, outsource business functions, and grow your business. As your master bookkeeper, Furever Bookkeeping is here to save you a ton. It’s time you understood where your business stands. Get away from working in your business and work on it, instead. Your time is super valuable as the primary decision maker. Call for your free initial financial analysis today! Our clients range in annual revenue from $300K up to in excess of $28M. Simple or complex financials across MULTIPLE industries are our Core Capabilities. Furever Bookkeeping, LLC brings 15+ years of expert bookkeeping to each of our clients. Kendra Moore and Bruce Attridge have a combined 37 years in: Bookkeeping, Accounting, Banking, along with experience as previous Business Owners. We are approved Accounting & Bookkeeping Federal Government Contractors, DUNS 079524284, as well as for the State of Maryland, NAICS 541219.